Here the Fridreichsborg Glacier in East Greenland is calving into Kangerluqsuaq Fjord. The dark sinuous rock band in the center is a medial moraine. A glacier is a large, permanent (non-seasonal) mass of ice that is formed on land and moves under the force of gravity. Glaciers may form anywhere that snow accumulation exceed seasonal melt. Alpine glaciers form in the mountains. Continental glaciers may cover large sections of continents as in Greenland and Antarctica. Recognition of past continental glaciation of North America and Europe was a major geological advance of the nineteenth century. A valley glacier is one that occupies a valley, whereas an ice sheet is a mass of ice that covers a large area as in Greenland and an ice cap is a mass of ice that occupies a high mountain area and flows outward in several directions. A typical valley glacier will add snow at its head and lose to melt at its foot. The snow line is the line below which the annual snow cover is lost in summer. The region above the snowline is the zone of accumulation; the region below the zone of wastage. If it gains more than it loses, its terminus will advance. It loses more than it gains, it will retreat. Snowpatch Spire in the Bugaboos. Glacial erosion is a powerful force that leaves a terrain with very high relief. In this heavily glaciated terrain, we can see the dark-colored ice at the foot of the glacier in the background and the much lighter-colored snow. The dark ice is ablating or melting. 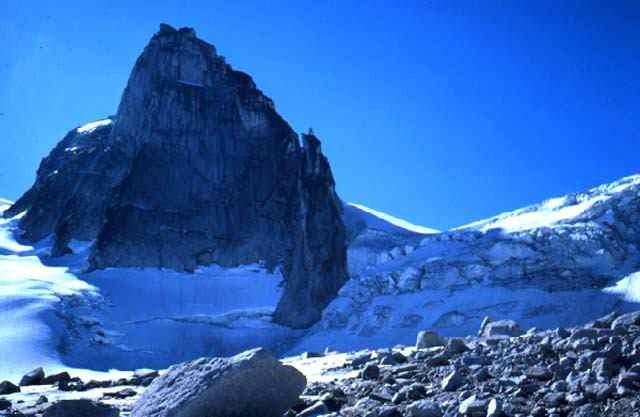 Here Bugaboo Glacier tumbles between Pigeon and Snowpatch Spires. When a glacier encounters an increase in the slope of its bed, crevasses form where the surface is in tension and close where it is in compression. When a glacier encounters a very steep slope in its bed flow may become chaotic as in an icefall. The irregular ice blocks are called seracs and may be extremely unstable. Ice will not hold a vertical wall more than about 40m high (130ft). At the bottom of an icefall the surface may be in strong compression and periodic waves called ogives may form on the surface. The crevasse at the head of a glacier that separates the moving ice from the stationary ice is called a bergschrund. Movement of valley glaciers varies from a few mm to as much as 15m per day. 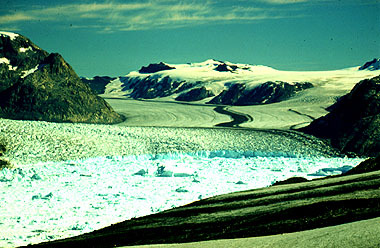 The very high rates of movement may develop in response to melt water in the basal layer and may give rise to a glacial surge ("galloping glacier"). Glaciers a powerful agents of erosion and leave characteristic land forms. Rock entrained in the ice will accumulate as moraines. Lateral moraines are those at the sides of the glacier, the terminal moraine marks the furthest advance of the ice. Recessional moraines mark intermediate advances. Medial moraines are rock entrained in ten middle of a glacier by the coalescing of lateral moraines where glaciers flow together. Other glacial landforms include drumlins (rounded, striated outcrop hills), eskers (low sinuous mounds of till left by subglacial streams), and kettles (depressions in outwash plain left by buried blocks of ice). Glacial valleys have a characteristic U-shape with very little alluvial fill. They may have hanging tributaries. The steep-walled, semi-circular valley at the head of a glacier is a cirque. Where two cirques intersect the narrow ridge is called an arete. Aretes may intersect in a horn. A glaial valley that opens to the sea and has been flooded by ocean waetr isa a fjord. Great continental ice sheets have covered much of the Northeastern US and most of Canada, as well as northern Europe and Asia during the Pleistocene. There four major advances in North America named after the states where prominent terminal moraines are found: Nebraskan, Kansan, Illinoisan, Wisconsin. Each of the major advances lasted more than 100,000 years and the interglacial periods only about 20,000 years. The Wisconsin advance reached its peak only about 18,000 years ago and the last remnants melted away less than 7,000 years ago. Milankovitch cycles. These are the cyclical precessions of the Earth's rotation axis. The precession has a primary period of 21,000 years. Charnges n the angle of the rotation axis relative to the ecliptic plane appear to strongly correlate with general changes in average surface temperature. Greenhouse gases. Certain gases in the Earth's atmosphere are opaque to IR radiation. This does not affect the amount of radiation received from the sun but limits tha amount that can be re-radiated. Carbon dioxide (CO2) is a greeen house gas, and atmospheric levels of carbon dioxide appear to have been declining over the past 100 million years, but are now rapidly rising. Ocean circulation Changes in ocean circulation may be responsible for the rapid changes in climatic conditions seen in the ice core data. If warm Atlantic water were to enter the Arctic Ocean it might not freeze over in winter and the resultant increase in moisture as snowfall might initiate a glacial advance. Plate tectonics. The position of continents would change ocean circulation patetrns, and the position of mountain ranges would alter air circulation patterns.